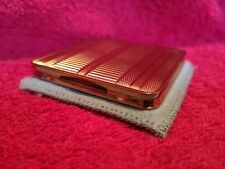 Vintage Gwenda Art Deco Brass Fluted Cigarette Case. I'd have loved to take the old varnish off and polish up but I know this would not be acceptable with collectors ! Room for 10 cigaretts. Impressive design. I think the material is brass. Size: 12cm x 8cm x 1cm. We will work with you. In very good used condition. PICTURES ARE OF ACTUAL ITEM. I have tried to make them as clear as possible. 8cm by 8cm. Highly reflective surface makes it difficult to show age related marks you would expect to see on this 50 year old item. Item pictured is the one you get, no trader style catalogue pictures in use. Front side Taj mahal is carved on other side Indian Map is carved. Truly Collector's Choice. Very Rare Collectible. Beautiful design. Weight:- 108 Grams. VINTAGE MID-CENTURY BRASS CIGARETTE CASE. ITEM HAS SMALL SURFACE MARKS BUT IS OTHERWISE IN EXCELLENT CONDITION. Engraved with birds and flowers with a ornate border. brass with a nickel plate coating and colouring. Unusual and unique piece. FRENCH DEPOSE. A BRASS MATCHBOX HOLDER. BRASS HINGED OPENING. A STUNNING. IF YOU PREFER TO COLLECT IN PERSON THAT'S FINE. WITH EXQUISITE HAND DECORATION. AND THE INITIALS AL ENGRAVED ON THE BACK. Three cigarette cases. One very unusual brass one with a British and German map engraved in possible WW2 or just after. Some damage to the white enamel but a very interesting and unusual piece. The other two cases are engine turned chrome in an Art Deco style. This is for all three cases and will be posted Hermes. Unused in original box. Romantic scene to front, engine turned detailing to sides and back. Length: 3.5" Width: 2.75" Depth: 1". WORKING ORDER "can be used. MAKE "orbit, pygmy, 2 unknown. Brass Cigarette case which is slightly curved. The case is in used condition with age related marks that include small dents, surface scratches and patches of rust (from another item), easily removed with water and tin foil. This cromium plated single cigarette roller and brass (previously plated) vesta case are clearly very old but it is unknown what period they date from. The roller shows signs of significant wear but appears to still be in working condition. THE CATCH WORKS IMPECCABLY AND THE HINGE SPRING IS WORKING. NOW WE GET TO THE TEDIOUS PART :D. ALSO IF YOU ARE LOOKING TO BUY. 16.5 cm by 12 cm by 6 cm. There is an engraved Picture of a mosque on the inside of the lid. Trench Art?. Has a trade mark on the inside of SMU or SUM, see pictures. In good condition for it's age. The elastic on the inside is very worn but still attached. Nice unusual retro piece, well - made. Hinges, catch and band inside all good. BRASS CIGARETTE HOLDER AND ASH TRAY. BRASS PLATED CURVED SLIDE TOP CIGARETTE CASE. If the item is collection we are 15 minutes from the M25 Dartford Crossing. on the A127. This is an original Art Deco Egyptian Revival piece dating circa 1920's or 30's. It has a small wood-lined section on the inside probably for cigarettes. Lovely vintage pigskin tan cigarette case with brass trim. Some obvious signs of wear and tear consistent with age - see photos. Measures 15cm x 8.5cms (17cms when open) Thanks for looking. A hand made unique solid wood brass work cigarette case. A well made case for 10 King size Cigarette. Hand etched Chinese Dragon. Cigarette Case. cigarette case Brown made by Lsg London. Condition is Used. Dispatched with Royal Mail 2nd Class. FINE GOLD DECORATED LEATHER AND DARK GREEN LEATHER INTERIOR. CASE SIZE 12.5 CM X 9 CM. I will get back to you as soon as possible. In very good used condition. They need a good polishing. I am not an expert on antique. just imagine the look on their face when you buy this and give this to them. age unknown. ideal gift. imagine how good it will feel when you own this now. just buy it for yourself because. Can't find a brass Emu case anywhere. This one more rare because it is brass. No Goldoid marks. Slight indent in one corner. Another corner bit of rubbing on the plate?. Vintage cigarette case - * Hand carved * Made in India * circa 1920-1930. Condition is Used. Dispatched with Royal Mail 2nd Class. Vintage cigarette case - * Hand carved * Made in India * circa 1920-1930 This heavy chrome cigarette case is beautifully carved on the front and back featuring the Taj Mahal and a map of India (in part) respectively and is beautifully embellished with brass on the front and back trims. It has a few scratches here and there but otherwise in very good condition.